And then the new tank was set up and all was right in the world.... for a few hours. Well, last Sunday I heard several curse words coming from the living room while Brian was working on the tank and I was like "OMG, what now....."
And then I saw a large water spill on our nice hardwood floors, and I was like "You've gotta be kidding me." So then he cleaned it up and had it working properly a couple days later. Well, that brings us to a recent heart-to-heart conversation between Brian and I about whether or not this fish tank is really worth so much hassle. Kelly: "Is this really worth it? I mean, you're always frustrated with the fish tanks anyways and they never seem to bring you much joy. So, uh, why did you even buy this?" Brian: "I bought it for you. I thought you wanted it." 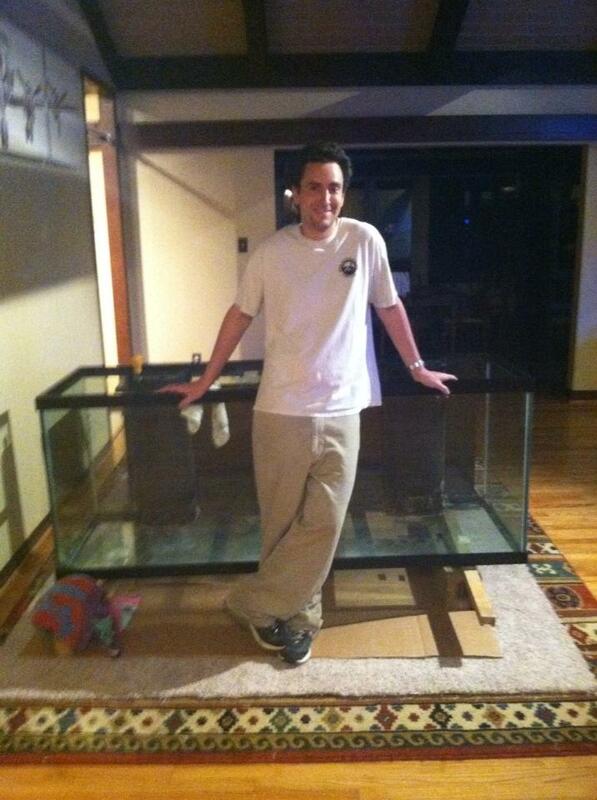 (Brian posed with the new fish tank before it was set up. Notice his smile.